A well deserved win, with the players getting their just rewards, having put in a very decent shift. The Tractor Boys had little to offer on a day when they simply couldn’t cope with a midfield that was on fire. Luke Freeman ran the show, with both Luongo and Scowen not far behind. These three are the core of the side and arguably one of the best in this division. That said, there is plenty of room for improvement. Not enough threat from the wide areas, and in particular upfront. I was delighted for Jamie Mackie who took his goal so well, and some sublime touches from Conor Washington, however I’m still not convinced? Great atmosphere, with the club once again doing themselves proud re the introduction of ex-players…may it long continue. 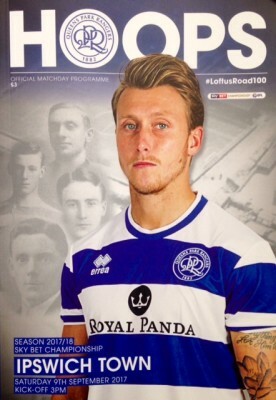 Queen’s Park Rangers maintained their 100% record at Loftus Road this season with a deserved victory over Ipswich. Jamie Mackie gave them the lead just before half-time when he slid in to meet Pawel Wszolek’s cross. Bersant Celina pulled a goal back late on with a fine strike from distance, but Tom Adwyemi fired a great chance over the crossbar as QPR held on. Despite Ipswich’s late pressure, QPR were much the better side and could have won by a wider margin had Conor Washington taken chances that came his way, though they were perhaps fortunate that the referee missed a handball in the build-up to their first goal. He glanced a header narrowly wide from Massimo Luongo’s cross, while Bialkowski saved twice to deny Freeman as well as tipping away a shot from Josh Scowen. Washington then spurned a one-on-one chance, but a goalmouth scramble in the second-half almost saw the home side go 3-0 up. Ipswich have now suffered consecutive defeats after Mick McCarthy’s side won their opening four Championship fixtures. It was an impressive team performance in W12 on Saturday afternoon. Everyone did well and there was plenty of solid tackling, good possession, movement and we created a number of goal-scoring opportunities. Jamie Mackie was in the right place at the right time to bury Wszolek’s precise cross near the end of the first-half. The R’s were even better after the break and Alex Smithies was hardly troubled. As ‘quick-feet’ Luke Freeman broke I was shouting for him to lay the ball off to his left and he then let fly from just outside the box and his low shot hit the corner of the net. Despite Rangers’ dominance it could well have ended very differently. Celina cut-in at pace from the wing, passing QPR defenders, before belting the ball wide of a diving Alex Smithies. And after five added minutes went up, Tom Adeyemi fired over the crossbar from close range. At half-time, 20 ex-players were introduced; Mike Barber was followed by Roger Morgan, Tony Hazell, Mark Lazarus, Frank Sibley, Phil Parkes, Don Shanks, Wayne Fereday, Gary Micklewhite, Paul Goddard, Bobby Hazell, Peter Hucker, Warren Neill, Paul Parker, Andy Sinton, Les Ferdinand, Danny Maddix, Lee Harper, Martin Rowlands and Big Dan. Andy Sinton spoke very well about the fans and what the Club means to him and while he was talking, Big Dan spotted a loose ball, took a few paces and with a big smile on his face, stroked it into the empty net.